Whether you’re in Canada wanting to reach the French-speaking market or want to expand your market to Spanish-speakers in the United States, using a bilingual voice over in your message on hold and automated phone prompts is good for business. Language is woven into how we communicate, think and feel. 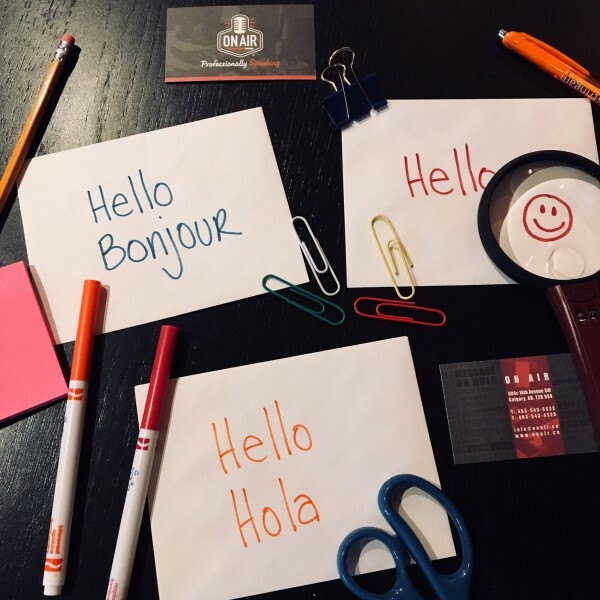 Reaching a customer in their first language can help them connect with your business and can have a positive impact on their experience with your company. Your customers will see your efforts in trying to serve them in their first language and that shows real commitment to thoughtful customer service. Not only will bilingual voice recordings help you reach your local population, it can expand your global reach as well. If you are writing your message on hold or phone prompt scripts in English first, make sure the person translating them into the other language is certified. That means they will be fluent, an experienced translator and a good writer in both languages. The tone of your message can get lost in translation, so it’s important the translator understands the company’s brand voice, goals and intent for the message being translated. Also, sometimes the literal translation of an English voice over script to Spanish or French can be too long or awkward to flow nicely. It can also run over the allotted timeframe for the script and will have to be edited appropriately. An experienced translator can help maintain the message while making any necessary changes. 2.Always opt for a professional voice over artist. Just because you have an uncle that speaks French, doesn’t mean he is the right choice for your audio recording. If you were to compare an amateur recording with a professional voice over, you would be shocked by the difference. Awkward pauses, loud breathing, mispronunciation, lack of energy (or too much energy), putting emphasis on the wrong words are all common mistakes in an amateur voice recording. Professional voice over artists have perfected their art and have years of experience. They can more effectively share your message in a compelling, professional and engaging way. This is especially important if you require your message in another language. 3.Consider regional or specific dialect. The French spoken in Quebec can be a little different than the French spoken in parts of France. Likewise, the dialect of Spanish speakers from Mexico and Central and South America can differ compared to Spanish spoken in Spain. When choosing a voice over artist, On Air can help select a voice that offers a specific regional dialect or a neutral, universal accent for the language you need. On Air offers multilingual voice recordings in over 20 different languages including French Canadian, Parisian French and 4 regional Spanish dialects. We have worked hard to build a pool of talented voice artists both locally and globally and can accommodate your bilingual or multilingual voice over project. We only use certified translators and interpreters in every language we offer to make sure the meaning and tone of your message are not lost. Learn more about bilingual and multilingual voice overs. The average hold time is 38 seconds.